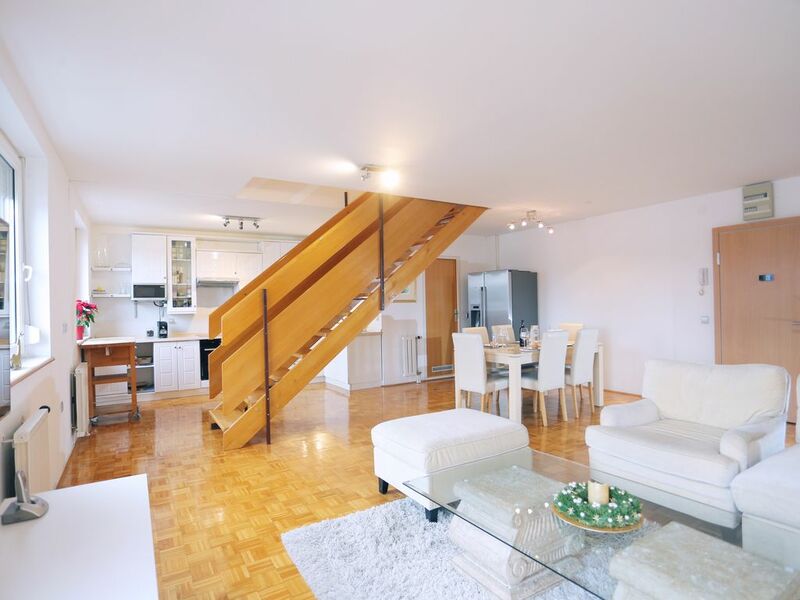 Beautiful spacious apartment with open floor plan in center of Ljubljana. First floor of the penthouse has a large living room, dining room, toilet and spacious kitchen with all the amenities. On the second floor there are two bedrooms, bathroom and on suite office which can be used as a third bedroom with private bathroom. There is also big terrace with stunning views on Slovenian Alps. All the rooms have views on old city centre of Ljubljana and its castle. As it is located 10min walk from old city centre, everything is accessible by foot, supermarket is 50m away, bars, restaurants, and beautiful landmarks of Ljubljana are just minutes away. There is also a secured covered garage for two cars, for those arriving with cars. Nice and clean flat with very kind owners. The flat is a 20min foot walk located from the center. Supermarket is located in the neighborhood and opened 7days a week. We enjoyed the stay and hope to come back soon to Ljubljana.